Cuisine Marine – Sailing Mexico and Living It Up! First post in a long time, goofing off is hard work. We do have some older content we’ll try to load up on this site soon. We collected a “wish” letter from America this year. 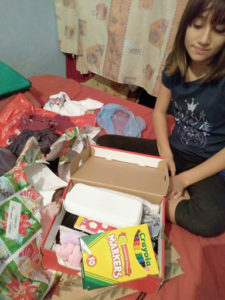 She asked for some school shoes and a jacket or sweatshirt. Easy Peasy. And a few extra things just for fun. There are always new things to be seen in the Sea of Cortez. It was just another lazy day in the southern Sea as we reach the mid-point of our sixth year in Mexico. You just never know what what each day will bring. 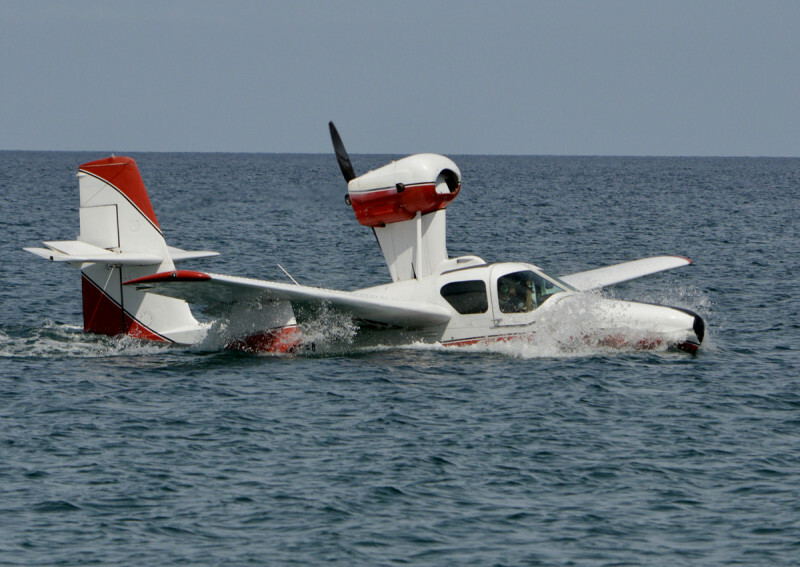 While anchored at Isla Espiritu Santo north of La Paz, a seaplane splashed down close to us in the lovely bay at Playa La Bonanza. A dinghy approached from a rather modest motor yacht nearby, there were several adults and kids aboard. The seaplane spent the afternoon taking three different groups aloft for some sightseeing. 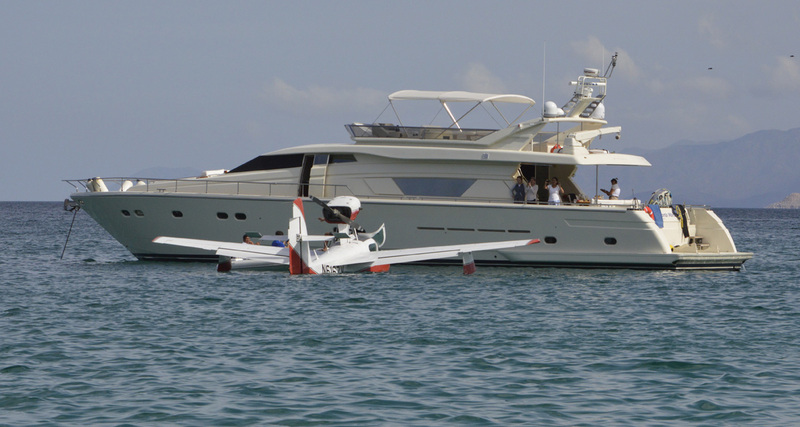 At one point the dinghy towed the plane over to the mothership, hopefully the pilot got some lunch. Finally, the plane left us around happy hour. Anchored of Isla Espiritu Santo north of La Paz, we were expecting some wet winter weather that was working its way down the continent, drenching the Bay Area a few days previous. Summer is typically the (slightly) wet season, so we were not expecting much more than a slight rinse. Little did we know we would get more than just rain! As the precipitation blew across the island and towards our bay (Bonanza), it started to get noisy. Small pea-sized hail pummeled us for 3-4 minutes. No damage done but it was noisy! Even before the hail had melted we were treated to a lovely full rainbow. And within a few minutes more, the sun was back out and the beach was sparkling again. Wild country, on the east side of the Sierra Las Tarabillas. School’s soccer field in the foreground. 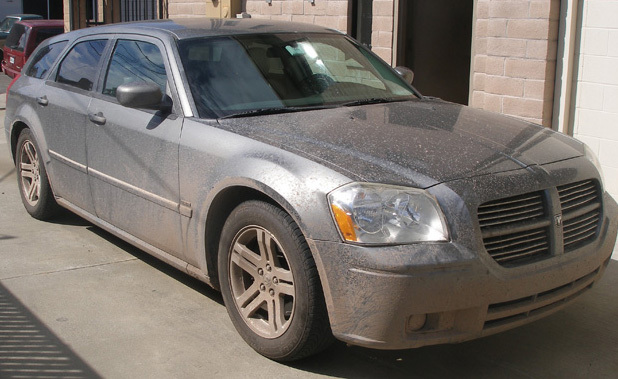 Many of our cruiser friends look for ways to help out local communities that they visit. One effort comes from a Rotary Club chapter in La Paz that counts a few sailors as members. Entry to the school. Note the blue water tank in the righthand photo. La Soledad is totally off the grid. Julie went along to make a delivery with the club on 12/16, and took a few photos of course. 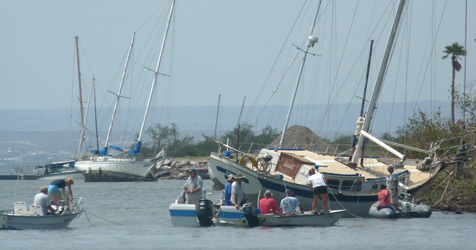 Thanks to our friend and Club Rotary Bahia de La Paz member Charles from S/V Shadowfax who helps explain the details:. Gifts for 80 kids were organized and numbered, and everyone was excited to see them. 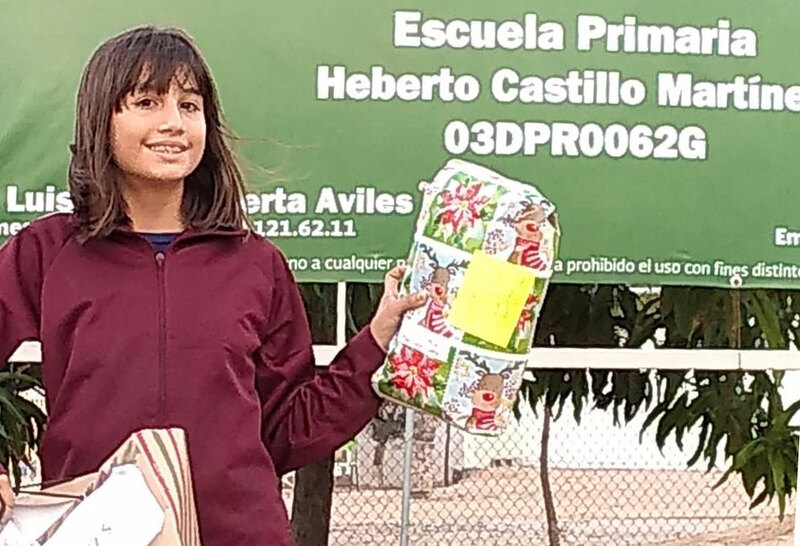 Generous cruisers and townspeople play Santa to kids from the Soledad Albergue, a rural boarding school located in southeastern Baja roughly behind the fishing village of San Evaristo. La Soledad is about a three hour drive from La Paz, about 1/3 (~75 KM) on paved roads and 2/3 (~64 KM) on a blend of rough gravel and soft sand. Live music and a short Christmas skit entertained the crowd before the gifts presentation. Kids aged 5 – 14 from widely spread rural families (ranchos and fishing villages) attend the school. It’s too far to go home at night for most of the children, so they live in dormitories. Money is in short supply in these areas, as sometimes kids will mention in their letters to Santa. Often we are the only source of Christmas presents. 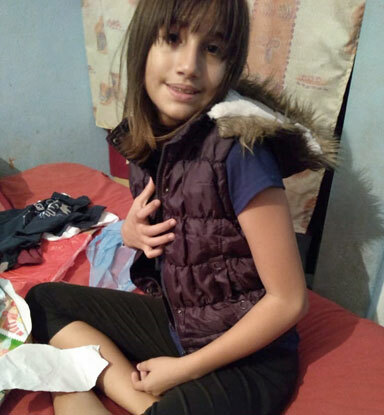 Some La Paz merchants also donated some clothing that kids could choose from. School cafeteria. The kids write letters to Santa, distributed by the club. Donors buy presents, wrap them and return them to the Club. About 30 gifts were provided from the La Paz cruising community. The Club delivers them to the kids during their Christmas program before they leave for the holidays. Rotary member and La Paz businessman Mr. Yee starts the festivities along with Laurie the school principal. Mrs. Claus gives a briefing. Lamb for lunch after the celebration. For the three years that we have participated, we have found the requests to be pretty modest, usually the wish list includes a pair of sneakers and perhaps an item of practical (dress pants, sweatshirt, etc.) clothing. We usually add in a few other generic items that we figure will either be useful, fun, or able to be shared with others. Our friend Charles usually appears as Santa to help hand out the gifts, but as he had to travel to the U.S. because his mother was in the hospital, his wonderful wife Carol filled in as Mrs. Claus. Once all the gifts have been handed out, then there’s a signal that everyone may open them. Most everyone waited patiently! Check out those fashion shoes! La Soledad is pretty self-contained. There is a fresh water source nearby which is pumped to storage tanks. The international Rotary (as well as the local chapter) is involved in an initiative to bring inexpensive water purification devices to remote areas, and the school may be a beneficiary of this program soon. Do kids in the U.S. smile this much when they get socks? The Rotarians (including exchange students from Brazil and Germany) with one of the truckloads of gifts. Here’s a collection of image from the last year, finally getting around to posting them. After the Baja gets lots of rain, the butterflies proliferate. 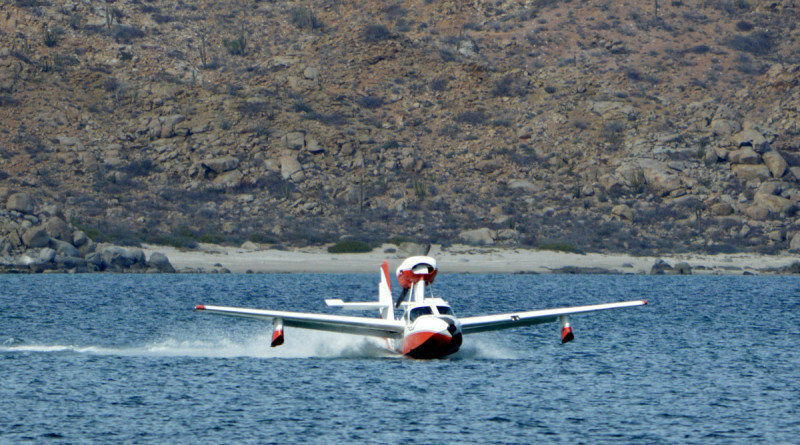 Here are a few that flew aboard to visit during our November passage up to the Loreto area. Our slip in Marina Palmira is right next to a hotel with a lovely pool and garden area. Good place to attract hummingbirds. This one flew out to hang and pose on a Voyager jib sheet line for a while. Another boat in the marina received a nest! Elusive cetaceans. At least some of these are probably pilot whales. This is as far as they come out of the water. Maybe a couple dolphins also hanging with them. Central Sea of Cortez, probably near Isla San Marcos. Seagull (dispute? kiss? ), Puerto Escondido. Sequence that Bill shot off Isla San Marcos. Probably mobula rays, they love to jump out of the water, no one knows quite why. and finally, blue footed booooooobies. Odile’s predicted winds on the left, predicted wave heights on the right. The major milestone of this cruising year has been Category 4 Hurricane Odile, which reached La Paz in the wee hours of Monday September 15. It’s very conservative to say that winds were in excess of 100 MPH and Wikipedia reported 130 MPH. It was a big, nasty storm. Satellite photo as Odile approached Cabo San Lucas. Predicted path (ultimately went more to the east). Many areas within Baja California Sur lost electricity (92% according to Wikipedia) and had typical damage: windows broken, torn roofing, trees and vegetation destroyed, power and traffic lights and poles down. In the first week after the storm there was some flooding, fuel shortages, businesses closed, etc. Many of the most modest dwellings in the area, including some of the fishing villages along the Sea of Cortez, were severely damaged or destroyed by wind or flooding and there have been several campaigns to provide assistance to the most needful. We and others in the cruising community have donated cash, groceries, clothes and school supplies and household items. The residents and cities of Cabo San Lucas and San Jose del Cabo seemed to suffer the greatest damage including the international airport (and the Costco, ay caramba!) was offline for a few weeks. We have yet to be down there to see for ourselves, we may get a Costco “fix” next month. Voyager was securely docked at Marina Palmira and had no damage. Two of our “sister ships” on the same dock experienced a little cosmetic scuffing while their boats tilted to rub the dock in the strong winds. We were in the Bay Area at the time and of course monitored the situation closely via the internet. The wonderful folks (Susan and Dennis Ross/Ross Marine) who watch our boat while we are away were able to send us a “so far so good” email on Monday morning. Then, telecommunications were offline for a few days until we heard further that all was well in fact for Voyager. Of course it was a little unnerving to not be there to observe for ourselves. It was also good for us to instead be in California “out of the way” of recovery/repair efforts and folks dealing with shortages (temporarily) at stores and gas stations. The local “Mickey D’s” was shut down for awhile, but not our favorite taco stand! Other sailors were not as fortunate. The majority of our personal friends were also docked in marinas and had none to minor damage. About 20 boats in the La Paz anchorage (not tied to a dock but instead at anchor or on a mooring), were grounded or sunk and three sailors were killed. Some of the sailors had the opportunity to shelter at a marina dock to avoid the worst of the storm and instead chose to stay “out;” that is the most unfortunate aspect in our opinion. 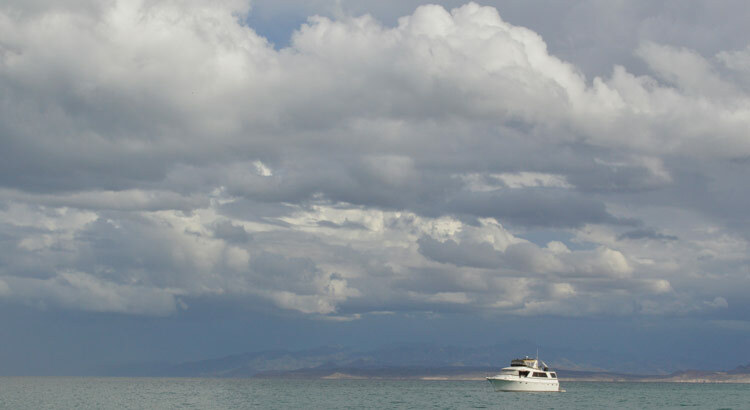 Due to normal tidal currents, anchoring off La Paz can be tenuous in even good conditions. Furthermore, many boats fell upon one another (not secured properly?) at a dry storage yard next door to Marina Palmira, including our friend Ken on Drifter (hoping his damage was minimal; we still haven’t heard the diagnosis). In the weeks after the storm, a devoted contingent of the year-round boaters in La Paz helped to rescue many of the boats that were stranded on beaches and shoals. A few boat photos shared here were taken by our friends Dana and Bill a few days after the storm. We drove back to La Paz about 3 weeks after the storm had passed; the city was bouncing back quickly. Highway 1 (the only route from Tijuana to Cabo) was impassable in a few sections for a few days after the storm but the road was back to pretty normal quickly. We had one very short section with 6” or less of water to drive through. The entire peninsula is even greener than before, flowers blooming along the roadsides, and some dry lakes are no longer dry! All the rains have helped spur a Dengue (mosquito-borne illness) epidemic on the Baja, so we have been extra vigilant with the bug repellent lately. Very green Highway 1 down the Baja. The one puddle we had to transit through. We have been visiting the Loreto area for a few weeks, and there are still three wrecked boats to see that demonstrate the power of the storm. Several others are hauled out in the local boatyard with various degrees of damage. Let me preface this by saying IMHO one can eat really well down here without bringing anything. Uncooked meat wait to buy in Mexico, sometimes it’s a mad cow scare or swine flu (didn’t I just read about a bird flu thing going on in Europe?) or something that gets the attention of inspectors and they can make you discard items when you enter the country. “Fishing with Pesos” – buying from a shrimper in Agua Verde. Desert blooms on the Agua Verde hills. As food nerds and we HAVE the ability and opportunity to bring goodies down, so we DO! We are probably particularly spoiled based on the fabulous availability of food items in Northern California. Here’s what’s on OUR running list: YRMV…depends on what you like and use a lot of! Last 2 drives down we have stopped at Corralitos southeast of Santa Cruz 831/722-2633 – We buy some of their smoked sausages…they will vacuum pack…we drive them down the baja in an iced cooler…then keep them in freezer for months. Favorites: coarse Polish, Bavarian, German. On rare occasions you’ll find some Johnsonville polish type sausage here. California wines – cost 2x and more down here, and price will only go up…one can enjoy the French, Auz, NZ flavors in Polynesia. Mexican wines we haven’t learned enough about (impression is good ones are more than we like to spend), we find some Chilean wines here we like in the $8-10 range. Premium liquors – if you have a Grey Goose or Bombay or Glenlivet, etc. habit…stock up. good Italian sausage! – In general, the sausage down here seems to be made with leaner pork, so they add salad OIL to the sausage. Also seasonings are not as good IMHO….Exception is two vendors at the La Paz farmer’s market – a wonderful German girl Manuela who makes some lovely sausage (brats) and pate, smoked pork, baloney, and other treats. Also a gringo couple making decent Italian sausage, quiches, and other savories. Bill’s “No Knead Bread” Yummmm! 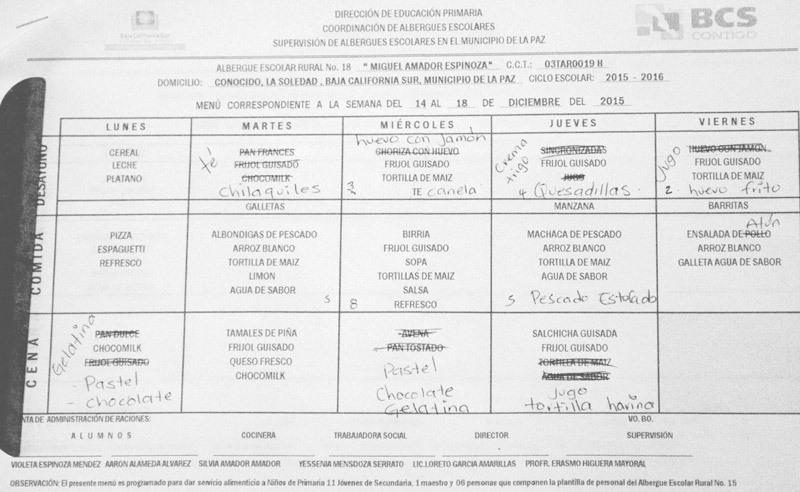 Peanut butter (cheaper in U.S. and more varieties)…watch out for a Mexican one (skippy?) with honey added YEEEECH! We won’t make THAT mistake again! Red wine vinegar in gallon size, finally found one in Loreto last week! Smaller sizes available in misc brands…Regina, carbonelle are maybe the most familiar. I like those small bottles of delallo lemon juice, don’t take up a lot of room in the reefer once opened. (Nob Hill in San Carlos). WHEN you find lemon juice it’s going to be reallemon or a generic. Fresh LEMONS are not common, limes of course ubiquitous. Marinated artichoke hearts – if you use a lot, get a couple big jars from US Costco, I think I have seen in Cabo. I’ve been bringing down those “litehouse” brand freeze-dried spices, have not formulated a strong opinion as to their quality. decent traditional spice selection here – have not seen oddball flavors like “herbs de provence” and celery flakes – fresh herbs other than cilantro and parsley are a rarity. Bi-weekly (albeit small) farmer’s market in La Paz often has nice fresh Basil, arugula, some other goodies like that. ESPECIALLY IF YOU HAVE A DOUBLE SINK to store it in – buy the biggest that will fit SNAPWARE plastic box and lid for your “biodegradable trash” (veg peels, etc. stuff that can go overboard)…it will allow your “regular” trash to stay drier and sweet smelling until you find somewhere ashore to dump it or burn it. Brown sushi rice, or fancy asian rices kagayaki etc. If you want some upper end bread flour (king Arthur etc. ), rarely seen here – there’s lots of ordinary” white and whole flour around…we are just starting to play with bread making. 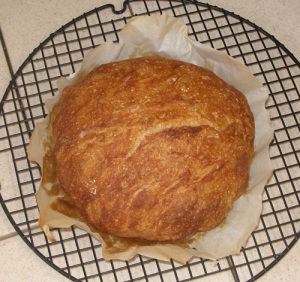 “No Knead baked in enamel/cast iron – le crueset-type pan (we have a cheaper lodge, is short enough to barely fit with oven rack removed) – has been most successful for us so far. Yeast is available, blocks more commonly found than individual packets. 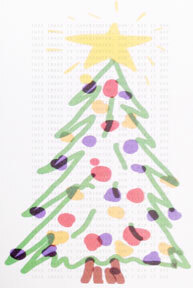 While I was hunting some info from some past receipts (I scan most – too much time on my hands! ), here are some prices from some miscellaneous items purchased at Mex. chain grocery stores during late 2013 & 2014. One CAN eat inexpensively here if one focuses on the basics, but I have a feeling we spend as much on groceries down here as we would in the U.S.
Shallots, fresh (hard to find) 169p/KG! One of our favorite things to do while docked in La Paz, is to visit the Madero Street Farmer’s Market. Held Tuesday and Saturday mornings, it’s a great place to stock up on some of our favorite goodies. It doesn’t take up more than half (one side) of a block, but there are plenty of treats to make cruisers happy. This winter there have been at least four produce vendors, a few crafts tables, eggs, honey, baked goods, hand-crafted fresh organic cheeses, smoked fish, coffee, meats, and home-made tamales ($1). Pan de Les Bakery anchors the market with Les’ great breads, crackers and pastries. His wife Diane’s amazing gift shop is next door. Occasionally a guy with a bucket of lobsters or shrimp wanders by. We often buy from Manuela and her daughter “The Sausage Ladies,” who make fabulous brats (spicy and mild, 4/$5), pate, cold cuts, and sauerkraut. Kale is one of our favorite produce growers/vendors who specializes in lots of fresh Baja-grown greens and herbs (his beautiful basil lasts up to two weeks in our “green bags”), tomatoes, root vegetables, plus beautiful strawberries ($2/basket) this time of year. Prices are not far off from what we would pay in the Bay Area, and in some cases at higher cost than the chain grocery stores but everything is lovely and tasty.